I went to visit Requiemart this past weekend and we took a run up to Animadness together. 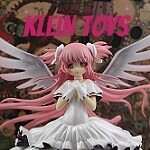 Animadness is located in Waltham, MA and they are an anime figure store that also happens to sell Pullips. 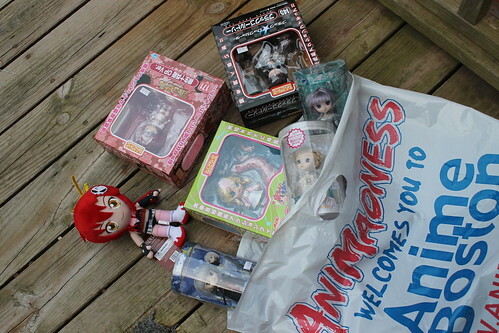 Animadness is having a sale this month to make room for new stuff, everything in-store is on sale (figures and dolls are 10% off) so it seemed like a good excuse for a visit. Unfortunately, I forgot my camera so no new store pictures this time around but there are plenty of pictures of the store on my flickr from my previous visits. So what did I get? 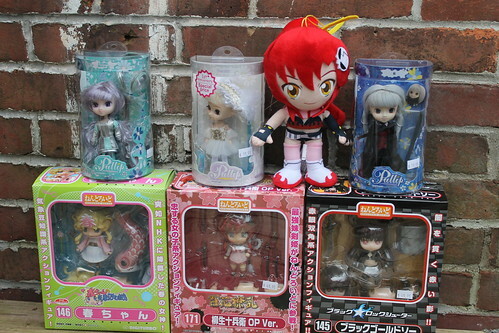 Three nendoroids, three little Pullips and an anime plush. Requiemart had told me a while ago that once I started with articulated figures, it’s hard to go back I’m really starting to think she had something there. Basically the only figures I am drawn to these days are articulated figures like nendoroids and figmas, the others are nice but they are static they can only be photographed from so many angles. The three nendoroids are Yagyu Jubei from Hyakka Ryoran Samurai Girls, Haru-chan from Haru-chan’s Weather Trivia and Black Rock Saw from Black Rock Shooter. Yagyu Jubei was actually what brought me to Animadness, I had actually asked them to let me know when they got her in stock as I was very interested in her. I’ve been rather drawn to Haru-chan ever since she was announced due to her hyper adorableness and her bright color scheme, I had seen her on my last visit to Animadness but was able to resist her this time I was not so lucky. I love Black Rock Shooter so I couldn’t resist Black Rock Saw nendoroid especially since she was the last one they had in stock. This entry was posted in 2011- 365 Toy Project, anime figure and tagged anime figure, black rock saw, black rock shooter, freeing, good smile company, gurren lagann, haru-chan, haru-chan's weather trivia, little pullip, nendoroid, yoko. Bookmark the permalink. I’ve always liked the look of thatHaru nendoroid. Also ❤ Yoko plush. The Haru nendoroid is just too cute to resist, it’s impossible to look at without smiling. I’ve been after a Yoko plush for a while so I was very happy to finally find her!